I have this set in the gray and I’ve had it since 2016, and it’s beautiful. However here’s a little warning be wicked careful cleaning it. I accidentally got a little hair dye on the white side of the pillow shame when I was sleeping. Okay so.....a little oxyclean and gentle hand washing will pullout the hair dye. Not only did it fade out the hair dye stain it also pulled all the silver paint like material off of the pillow sham. The oxyclean is gentle enough to it your hands in it, what the heck? Looks like I have to order a whole new set for 1 sham. Beside this delicate concern if you are ordering my guess is the silver paint in time will also wear off in the washer machine too. 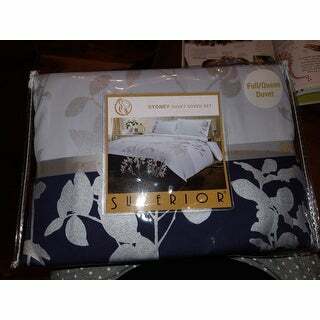 Superior is excited to present fresh and beautiful 100 premium cotton Sydney 3-piece duvet cover set. Exceed your imagination with this soothing cotton fabric featuring a fresh tonal stripe pattern and a soft sateen weave for luxurious comfort. The gorgeously accented branch-leaf graphic spray, designed in shiny metallic silver is printed on the right of the duvet cover and is sure to heighten the beauty and also to withstand multiple changes of the decor. Perfect for contemporary, modern, or Asian themed bedrooms, this duvet cover is available in two neutral and calming colors combinations: grey-sage-white or navy blue-light blue-white to create a serene ambiance. This gorgeous 3-piece duvet cover is crisp & clean giving your room a whole resort style decor. The duvet cover is easy to put on and take off and has a button closure. The buttons on the duvet cover are securely sewn and nicely hidden to make them almost invisible. This classy yet relaxing style with the right pop of color will surely brighten your room. Enjoy this set in full/Queen or King/California King size that consists of one duvet cover and two shams. Shams are pure white featuring a silver leaf motif on one end. This inviting and elegant duvet cover set offered at an outstanding value, is colorfast and machine washable. For drying, tumble dry low and remove them promptly from dryer. Always follow care label instructions for best results. FABRIC: 100 cotton ensures softness and breathability for a relaxing night's sleep. FRESH STYLE: The beautiful silver leaf motif on a wide striped pattern adds a charismatic appeal to your room. Complete your bedroom decor with coordinating Superior cotton sheet, pillowcase, and bed skirt, sold separately for a plush put together look. COMFORTING COLORS: Two color combinations grey-light grey/green-white and navy blue-light blue and white to suit a variety of decorating ideas. CARE INSTRUCTIONS: The set is colorfast and easily machine washable. For drying, tumble dry low and remove them promptly from dryer. Always follow care label instructions for best results. Dimensions 13.0 In. X 10.0 In. X 4.0 In. Very beautiful soothing colors. Quality is great! It's a very soft cotton and feels rich to the hand. I also, like others stated received two right side pillow shams. The flowers are printed the same on both sides so when you flip the sham for the left side the flowers are upside down. Over stock gave me a discount, and I am happy with that. You can't tell too much with the design. The design of this duvet cover is classy yet simple which fit perfectly for my asian themed bedroom. I have a down comforter in this duvet and the warmth is incredible while not being too hot. As this is a duvet cover, I do recommend clips to hold it in place. I bought a king size cover and the king size comforter fit perfectly without issue. I loved the looks of the duvet cover however I thought the section of sage green would be more pronounced. It is so light it almost looks white. The material on the duvet cover had holes on the light grey area on the outer site. Besides that defect, it gets very wrinkly after washing, but I like the color team and the bright colors. It's a second set I bought from overstock that had holes in duvet. The previous one was much worse though, it had many and they're very visible. Good looking. Doesn't wrinkle too badly. I read lots of reviews and wasn't sure how green the center stripe would be. My best description is that the stripe is green, but it's a gray green. You could pick up mint green accents in the room or go with a gray theme and it works either way. The accent plant design is a shiny silver, and has held up through two washings so far. There are no ties inside the duvet cover, so I'm going to add my own. But the duvet stays put fairly well without the ties. Even without ties, it takes several minutes to put the cover on a king size duvet and get all the buttons done. 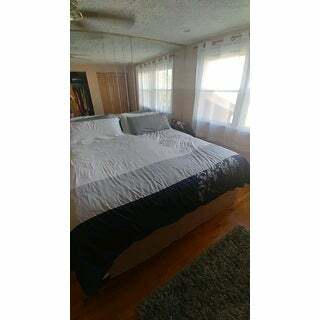 the duvet is a bit large for our king down comforter but drapes well and looks great. Thought the picture showed a "green" stripe next to the darker grey..is more a medium grey and looks very nice. This is a beautiful duvet cover. It can be washed and is so soft. This duvet cover is so soft and weighted perfectly. It's the most comfortable duvet I've ever owned. The color is perfect for my room and it has transformed the bedroom into a restful and peaceful area. Cons: I left it in the dryer to dry completely on low and it still came out wrinkly. Next wash, I will take it out sooner and lay it flat to dry. I still wouldn't return it and I would still recommend it. Great quality product! I recommend this duvet cover set. It's very nice looking. Love this set. Looks nice, and very comfy! Looks just the website pic. I’m happy with my purchase. Great quality. It is a nice summery print. The duvet cover set is very beautiful. Colors are bright and the quality of material is impressive. It adds style into every bedroom. I'm very pleased. Love it it’s perfect, the right colors and its exactly what I was looking for. It fits my daughters bed perfectly and definitely goes with the decor. I would definitely recommend it. I love the colors of this duvet. And the style is great!! But there aren’t any ties or buttons to secure it on the inside so the comforter just flops around in the duvet. Really nice, soft, easy to wash.
"I have always preferred comforters to duvet covers, but I cannot find this pattern in a comforter or bedspread. How do you keep the douvet from wadding up at the bottom of this cover? Thank you." Very good answer Steven V., but I would also like to add that you can sew in a duvet inside the cover permanently to make it more like an actual comforter. "Could you inform me of the size of the duvet pls"
I bought the queen size a few months ago and have been washing it once a week. Just measure it and the dimension is 87" x 89". "is the queen size colors - grey pale green and white? or in blues as am reading?" It is grey, pale (Sage) green, and white. Not blue. The duvet cover is light grey and light green. Yes, light green and grey. Very pretty! "Hi. Does this fabric need often ironing? Have linen sets worn for a night or two and looks unfresh.. it looking for such fabric "
I have had this for at least six months I believe and have never ironed it. The duvet comes out of the dryer a bit wrinkled, but it is a King, and therefore crowds the dryer. I find that once the comforter is inside and a day or two has passed that any wrinkles sort if relax out. "Where is the button closure located on the duvet? Is it at the foot?" "I have a black comforter. Is this duvet thick enough so that it won't show through?" Hello lacyrae77, based on customer reviews, the duvet cover is made from a light weight fabric. The black shadow of the comforter may be visible through the lighter underside of the cover. Thanks for shopping with us. "Are there ties inside the duvet? Is it wrinkle resistant? Thanks!" Hello kelly1952, this duvet does not have inner ties, it is not wrinkle resistant, but reviews have shown that wrinkling is not an issue. Thanks for shopping with us!